This enhanced color image of Ultima Thule was taken from a distance of 10,800 miles (17,377 kilometers) at 12:14 a.m. EST on Jan. 1, 2019, just about 19 minutes before New Horizons’ closest approach to the Kuiper Belt object. 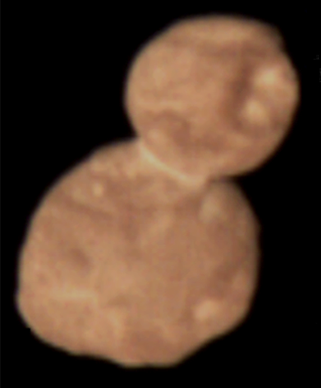 Taken by the Multispectral Visible Imaging Camera (MVIC) and produced by combining the near infrared, red and blue channels, the image highlights Ultima Thule’s reddish surface but is not how the object would appear to the naked eye. At approximately 350 meters (1150 feet) per pixel, this is the highest-resolution color view of Ultima Thule.